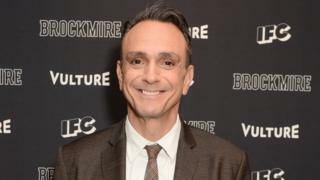 Hank Azaria says he is "willing to step aside" from his role voicing Simpsons character Apu Nahasapeemapetilon. It follows a documentary made by Indian-American comic Hari Kondabolu that argued the Indian character is based on racial stereotypes. Speaking on The Late Show with Stephen Colbert, the actor said his "eyes have been opened" by the debate and that he never intended to cause offence. He also distanced himself from the show's controversial response. Shopkeeper Apu has been part of the long-running animation series since 1990, with Azaria adopting an Indian accent to voice him. The character is one of several voiced on The Simpsons by Azaria - he is also the voice of Chief Wiggum, Comic Book Guy and bartender Moe Szyslak. There has been a focus on the portrayal of Apu since Kondabolu's 2017 documentary The Problem with Apu. The director told the BBC last year that the character was problematic because he is defined by his job and how many children he has in his arranged marriage. He added Apu was one of the only representations of South Asians on US television when he was growing up and that other children imitated the character to mock him. Azaria told Colbert: "The idea that anyone young or old, past or present, being bullied based on Apu really makes me sad. "It certainly was not my intention. I wanted to bring joy and laughter to people." When asked about the future of the character, Azaria said he was open to change and called for the South Asian community to be better represented in the industry. "I've given this a lot of thought, and as I say my eyes have been opened," he said. "I think the most important thing is to listen to Indian people and their experience with it. "I really want to see Indian, South Asian writers in the writers room… including how [Apu] is voiced or not voiced. "I'm perfectly willing and happy to step aside, or help transition it into something new. "It not only makes sense, it just feels like the right thing to do to me." Following the interview, Mr Kondabolu took to Twitter to thank Azaria for his words. The Simpsons' attempt to address the controversy in a recent episode sparked a mixed reception. In No Good Read Goes Unpunished, Marge is seen reading a book to daughter Lisa that has been changed from its original version to something more politically correct. "Something that started decades ago and was applauded and inoffensive is now politically incorrect. What can you do?," says Lisa. The show then panned to a picture of Apu, with the slogan "don't have a cow". In a statement to ABC News, 20th Century Fox, the network that airs the show, said simply, "The episode speaks for itself." The makers have not publicly commented further, but one writer, Al Jean, has vowed to "find an answer that is popular and, more important, right". Discussing the episode for the first time, Azaria told Colbert he had "nothing to do with the writing or the voicing [in that episode]". "I think if anyone came away from that segment thinking they need to lighten up…that's definitely not the message that I want to send."